Jade Restaurant's sumptuous A La Carte Buffet Dinner is making a return from 01 April 2014 after it was well received back in December 2014. The unlimited servings of appertizers, soups, main courses, rice and noodles dishes as well as desserts is back with a refreshed selection of more than 38 delectable creations comprising of familiar favourites and Jade's elegant creations. This all you can eat a la carte buffet dinner is available at $58++ per adult and $38++ per child. Let me introduce you to some of the new creations on the menu. 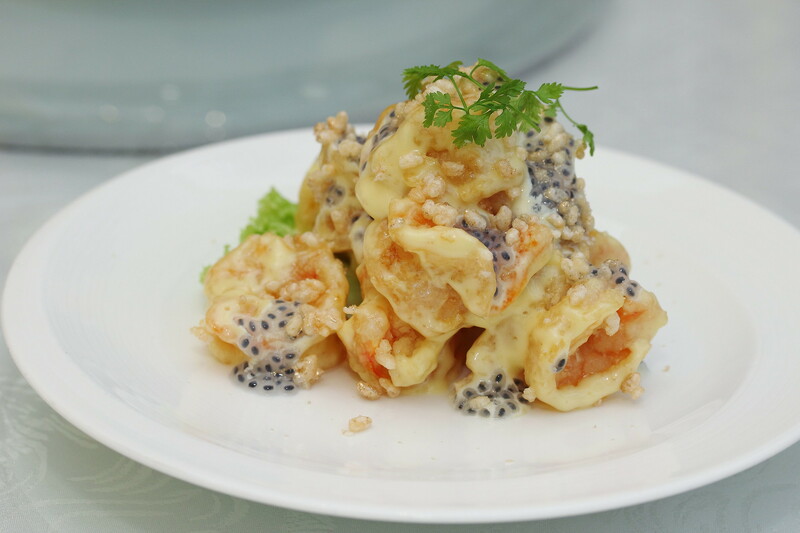 The Deep Fried Prawns coated with Passion Fruit Mayonnaise was huge and crunchy. The passion fruit mayonnaise lends a fruity sweetness to the freshest complementing it excellently. 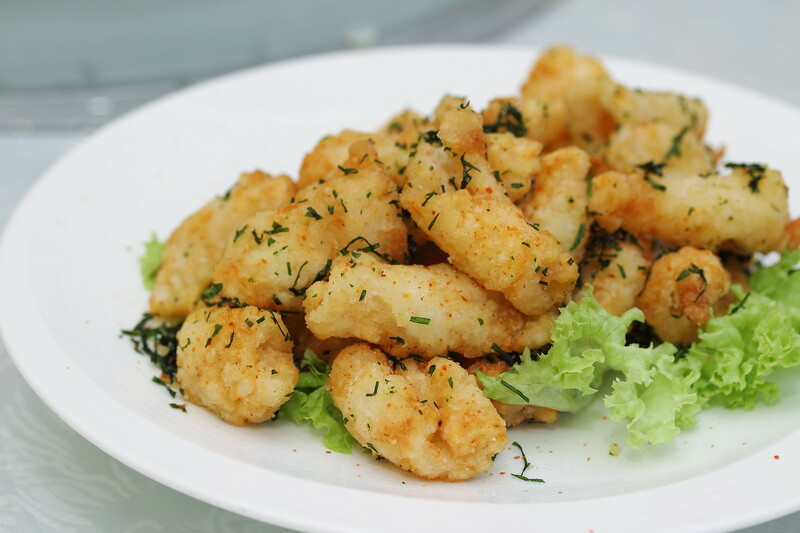 A new addition to the menu is the Crispy Squid in Seven Spices Fragrant Salt. Crispy and crunchy, this will be enjoyed by both adult and children. 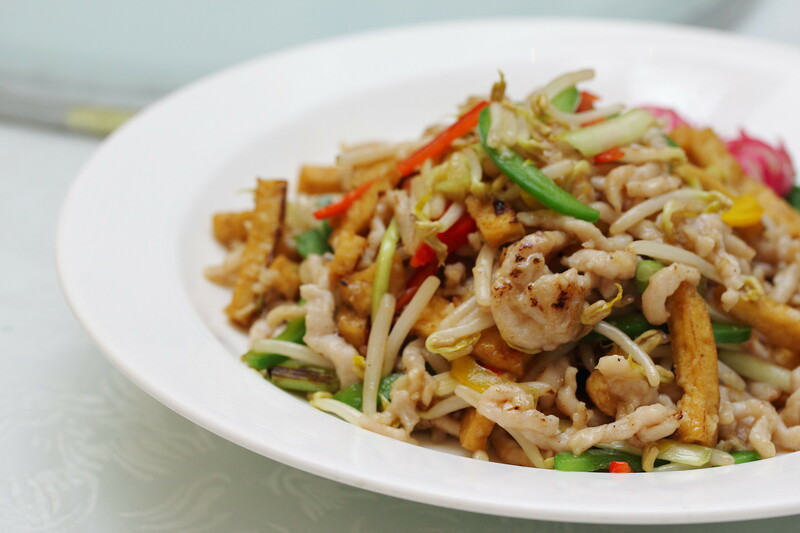 A very homely cooked dish of Sauteed Shredded Pork with Trio of Capsicum and Dried Beancurd. Could not help noticing that meticulous preparation behind the dish, with the pork, beansprouts and capsicum were cut to almost the same length. This simple dish stood out for me with its different layers of textures. Those that needs that greens can try the Poached Spinach with Egg and the Wok Fried Shredded Cabbage with Drief Shrimps and Chilli. 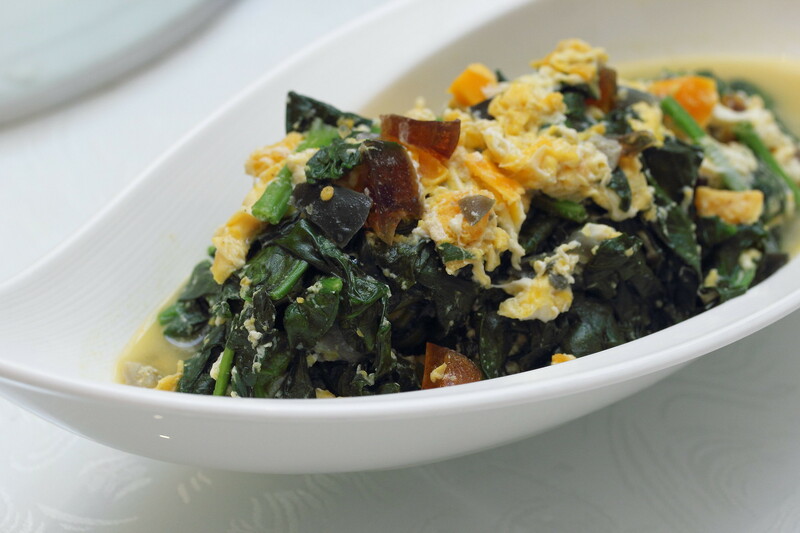 The poached spinach with egg is a classic restaurant dish, it is already a winner on its own right with the used of century egg and salted egg yolk. 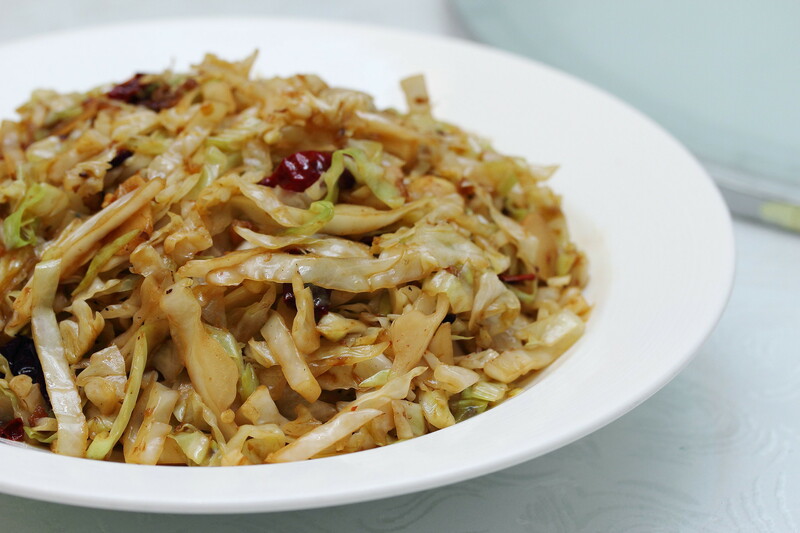 The wok fried shredded cabbage with dried shrimps and chilli already filled the air with its aroma. This further accentuated the sweetness of the cabbage. Interesting name isn't it? 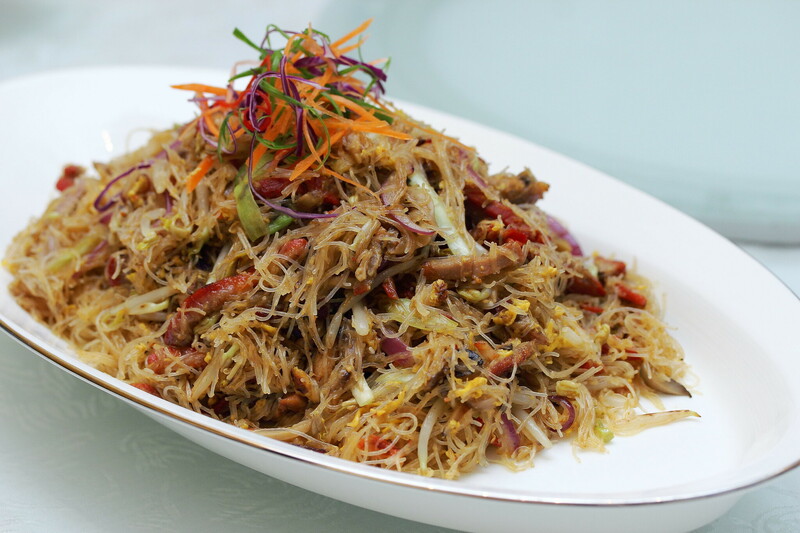 Wok Fried Vermicelli in Singapore Style. What exactly is Singapore style? My guess is this is inspired by the zi char dish Xing Zhou Beehoon (星洲米粉) which we Singaporean are used to and hence the name. 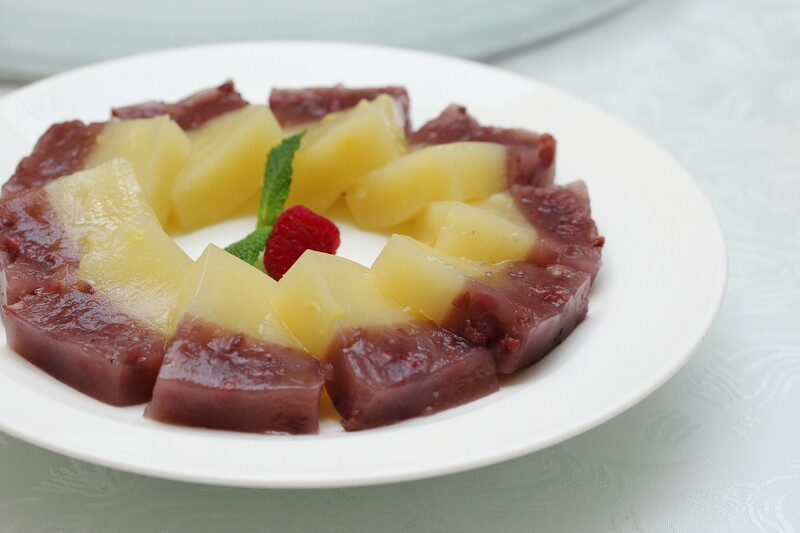 If I am not wrong the Chilled Yuan Yang Cake is made of red bean and water chestnut. A nice dessert that comes with a chewy texture. 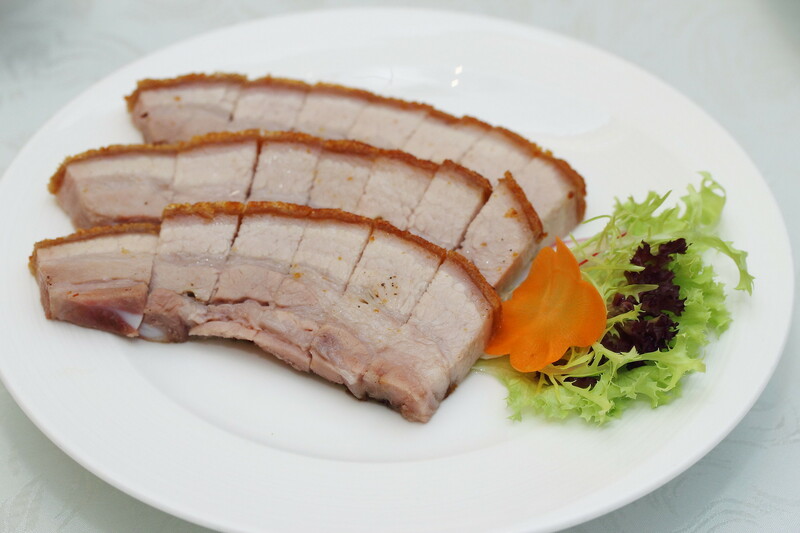 Besides the new creations, I am glad that Jade restaurant retain some of the old time favourites such as the Roasted Five Spice Crispy Pork Belly where I can indulge in the crispy crackling skin of the succulent pork belly. The Steamed Chilean Seabass with Preserved Olives were another popular favourite. 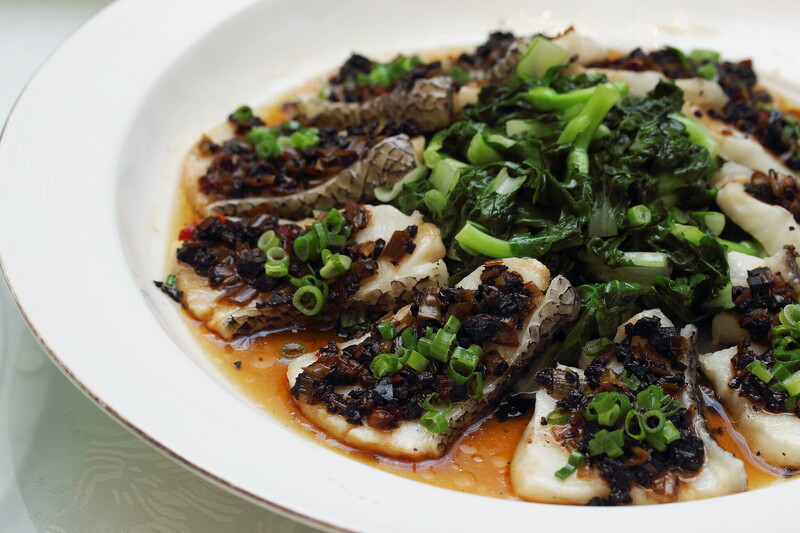 The combination of preserved olives and seabass was an unusual combination that works in harmony. If you don't want to get your hands messy eating chilli crab, then the Golden Mantou Stuffed with Chilli Crab Meat ($2.80 per piece) is your solution. 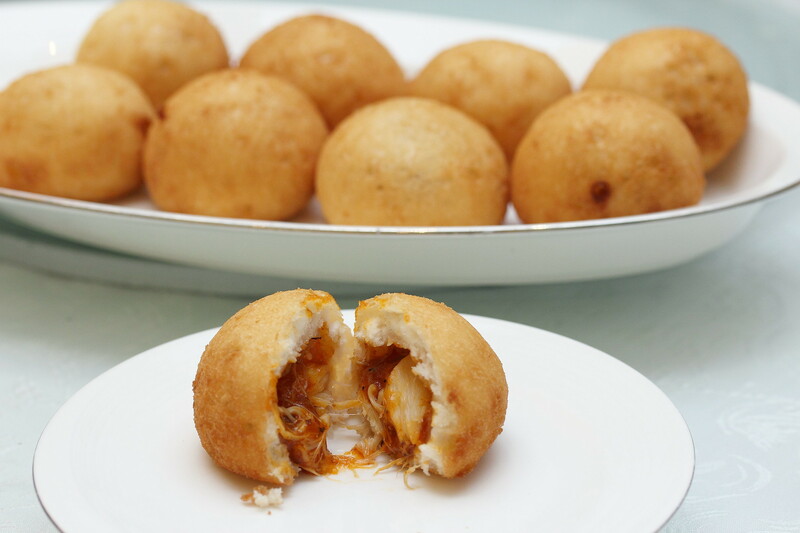 The golden bun is stuffed with luxurious crab meat and a delectable chilli sauce. I would prefer the sauce to be a bit spicier. 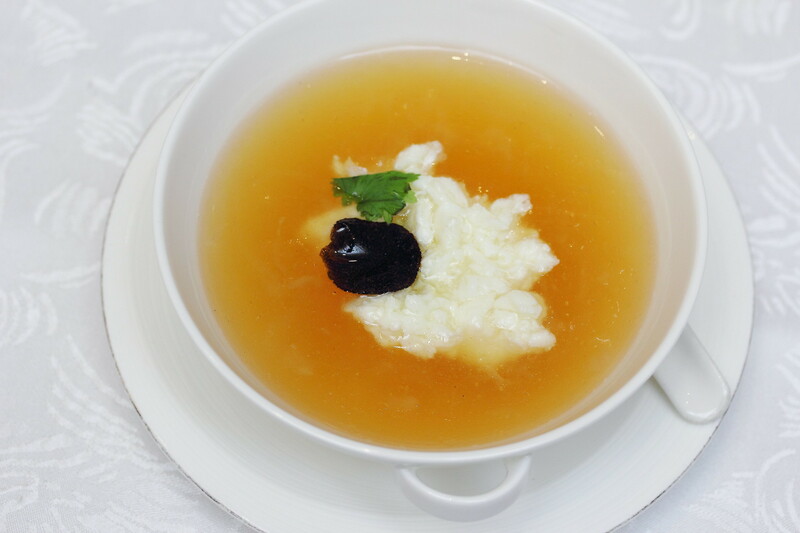 For a more luxurious dinner, one can add on $9 for a bowl of Braised Bird's Nest with Truffle Egg White in Superior Broth. I totally skipped the vinegar and pepper to fully embrace in this bowl of delicacy. Chinese dinner usually endss with a rice or noodle dish. 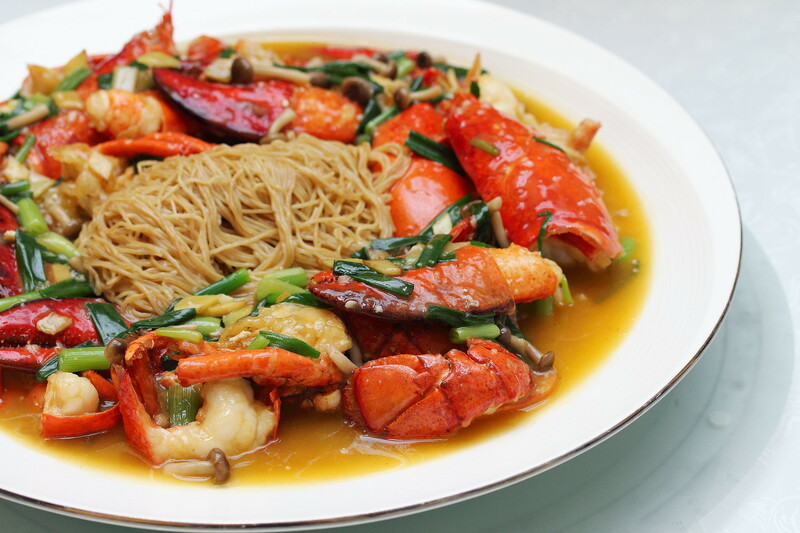 Why not wrapped up the dinner at Jade Restaurant with a bang in he Simmered Egg Noodles with Boston Lobster in Spring Onion & Ginger Sauce ($18). 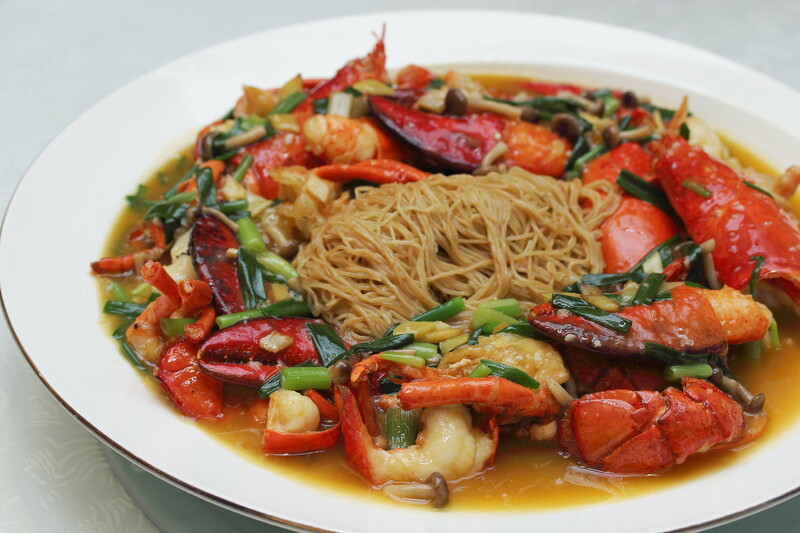 Fresh lobster with slurping good noodles, double happiness to end the dinner with a satisfied tummy. For a truly sumptuous feast, the restaurant's signature crisp-skinned Roasted Peking Duck with Marinated Orange Peel and Condiments is available at an additional $28++ for half a duck, or $48++ for a whole day. Do note that Jade restaurant's A La Carte Buffet Dinner is available from 630pm to 11pm at $58++ per adult and $38 ++ per child (6 to 11 years old).